October is a great month to learn about owls. It is hard to believe that there are about 200 different species of owls around the world. Wouldn’t it be fun for your students to find out what different species live on different continents? 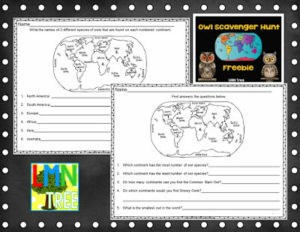 There are 2 fun scavenger hunts in this packet that can be done in pairs, small groups, or individually. If you would like to download this free packet, just click on the image below.